Paradoxically when we are in the depths of winter with the mercury plummeting outside, designers are thinking about clothing for sun-drenched days. Trying to evoke this mood when the snow is a foot deep and you are wrapped in several layers of clothing means creating inspiration boards to ignite the heat of warmer days ahead. Color Inspiration from John Singer Sargent’s ‘Corfu Light and Shadows’, 1909, and detail. Sargent’s skill in watercolor makes the paintings seem almost as realistic as photographs from a distance, but as you step closer, the individual colors that create the illusion are clear and brilliant. When viewed at very close quarters they are even more beautiful, and were the starting point using paint and mixes of colored thread and swatches to inspiring new blends of color and texture. 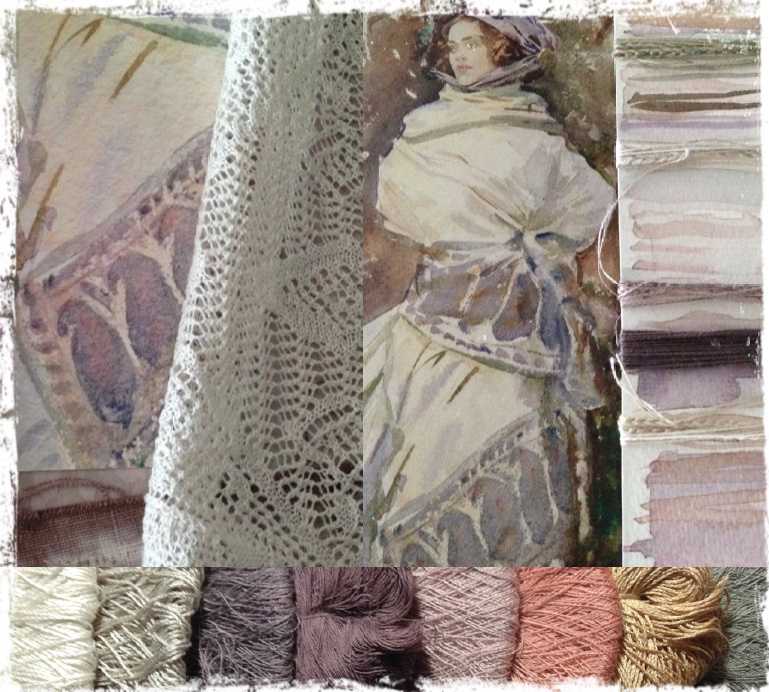 Color inspiration from ‘The Cashmere Shawl’. Mixed thread inspirations from detail of shawl and pointelle lace swatch. The figure is silhouetted against an earth toned wall. We love a distressed plaster wall, and the soft mauve browns in the background are exquisite counterpoints to the pale neutrals in the drapery. Perfect hues for high summer. Watercolor paintings, even when blown-up in scale, always seem to be completely harmonious. Mixing yarns in little pieces of crochet is a perfect way to decide on combinations. The best results will each be worked into a garment where sometimes over 30 different colors are used – even seemingly “solid” colors may be plaited with a complimentary color to create intriguing new blends. The small circular motifs were the start of an idea for patterning on a cardigan. Inspiration from ‘Carrara: Lizzatori’, 1911. 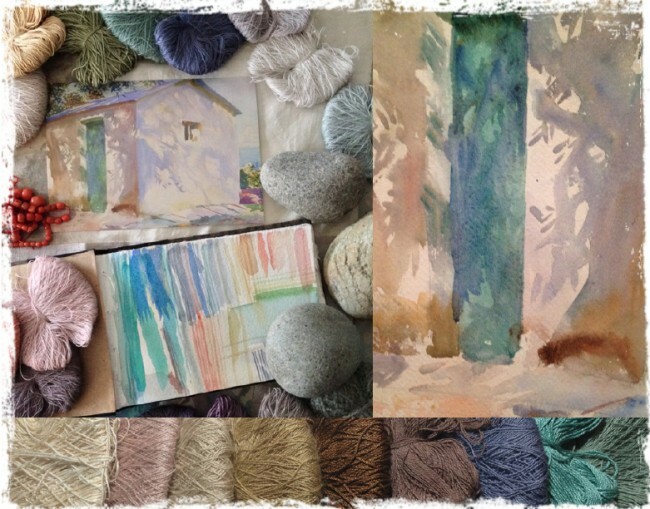 Crochet color swatches, yarns and illustration. See the John Singer Sargent exhibit next at the Museum of Fine Arts, Houston, March 2 through May 26. How wonderful to see you present these colors as inspiration from my favorite artist! Glad you enjoyed the post! Yes, his color palette is so inspiring when we’re in the depths of winter. Sargent is one of my favorite painters so I was delighted to see how you looked at his work, found inspiration, and translated that feeling of sunlight into this clothing collection. This is what sets Peruvian Connection apart and makes the color choices of every other clothing company I know of boring and predictable. Thank you for the kind comments! We’ll be sure to share them with our designers. Wonderful! I am so in love with the blues and blue green’s this year. 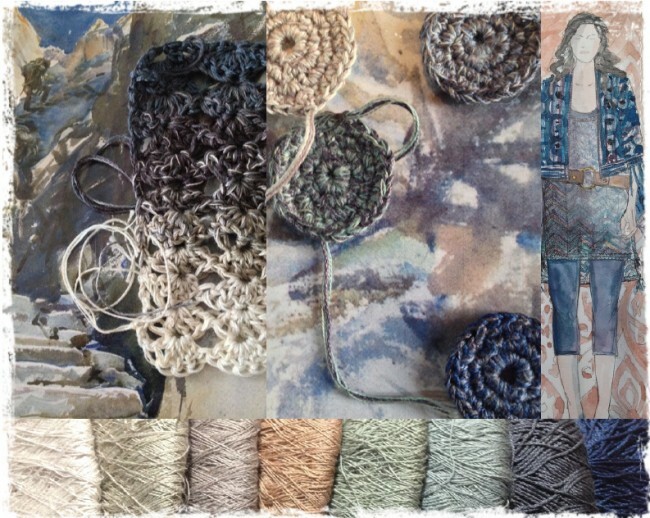 With the soft beige and tans and some earth tones, and crochet textures, my wish list is huge. Great job on the colors and continuing them and combining from previous seasons! I did not expect anything else but wonderful. This looks interesiing. I like the soft blues, the sof, pliablre maerials you seem to be working with. I’m sure the workmanship will be prima!